Chances are, by the time you find out you are pregnant, you are already a month along! This is because pregnancy is calculated from the first day of your last period. So, approximately two weeks between that day and the day you actually ovulate and conceive you are not technically pregnant, but it is calculated into your 40 weeks of pregnancy. So what occurs in the first month of pregnancy? for Mom: Approximately 14 days after the first day of your period, an egg is released and enters into your Fallopian tube where it awaits fertilization. Once fertilized, it moves to the uterus. You won't experience any changes or symptoms yet, you haven't even missed a period yet. Some pregnancy tests are able to detect early signs of the hCG hormone, so it is possible to get a positive at this point although they are most accurate once you've missed a period. 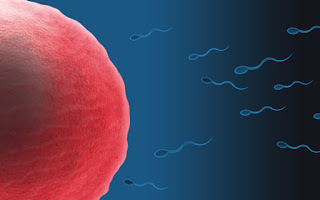 for Baby: Your partner's sperm and your egg have joined then they form an embryo. It is tiny at this point, only about the size of a pin. These cells will begin multiplying rapidly. The outer layer will form the placenta and the inner layer will become the embryo. for Mom: You may or may not experience symptoms of implantation which could include spotting and cramping. You will probably miss your period this week, which is when home pregnancy test are most accurate. Once you get your positive, make sure to check out our article: I'm Pregnant; Now What? 5 Things to do When You Find Out You're Pregnant. for Baby: The baby will now implant into the wall of your uterus. The amniotic cavity, which will fill with fluid, and the placenta, which will provide oxygen and nutrients for your baby, are now forming. Your baby begins to form a face, with dark circles for eyes. The mouth, lower jaw and throat are developing. Blood cells are beginning to form. 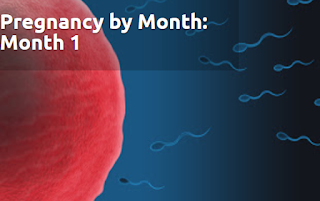 By the end of the first month of pregnancy, your baby is about 1/4 inch long.